Cork flooring for kitchens is one of the most comfortable options for people who like to cook or who just happen to stand in the kitchen a lot. As with a wine cork there is an inherent give and springiness to a cork floor that is very easy on the legs, back and feet. In fact, some cork floors are so springy that dropped dishes might just bounce instead of break. And because the cork the floor contains Suberin, a waxy substance found in the cork itself, cork floors naturally resist mold, insects, and allergens. Cork flooring for kitchens is quite stylish and comes in sheets, tiles or plank and in a wide variety of color options. What Is It? Cork is harvested from the bark of the cork oak tree, which grows in Mediterranean countries like Italy. The raw cork is ground up and then mixed with resins to make it rigid. It is then turned into planks and cut into floors. 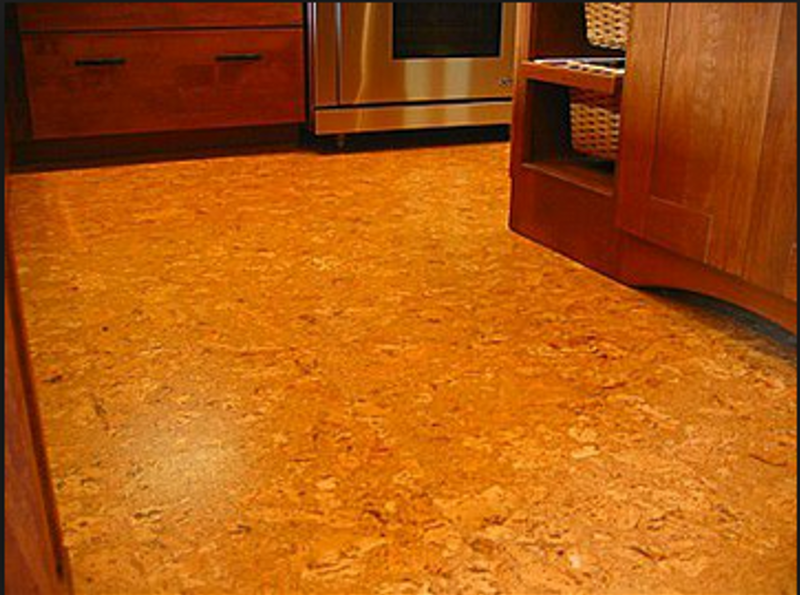 Durability: Cork flooring for kitchens is naturally resistant to water, heat, and mold. To reduce the impact of uneven wear, use mats or runner rugs for high-traffic areas. Also, like wood floors, cork floor surfaces can fade in direct sunlight. Cleaning and Maintenance: Be sure to clean up food and drink spills immediately. Vacuum and sweep regularly, and occasionally wipe the surface with a damp mop or cloth. Keep floors free of dirt and sand, as they can scratch the surface over time. Refinish when signs of wear appear. Color- Though all require sealing, cork flooring can be left natural, stained, or even painted for a variety of shade options. Finish- Some cork floors come prefinished, while others will be given a finish after installation. You can choose from a variety of finishes including polyurethane, wax and vinyl coatings. Thickness/Durability- Choose the cork flooring for kitchens that best suits your budget and needs. Thicker floors are better insulators, and denser floors are more durable. Underlayment- Cork flooring can be installed, either glued down or floating, over flat surfaces, including wood and concrete. At least ¼ Inch plywood underlayment is recommended when installing over existing floors. Cork flooring boards are designed to snap together easily for a floating installation. Tiles, which can be used to create patterns, are more difficult to install, as they must be glued. 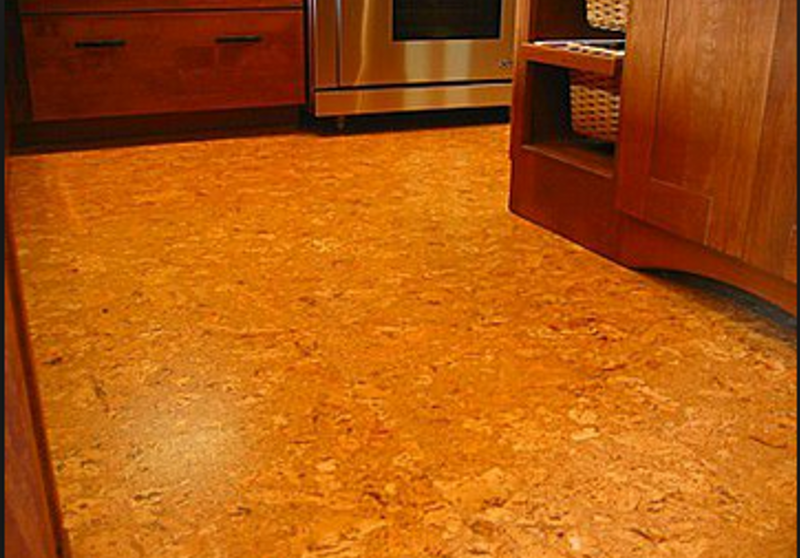 Cork flooring is a natural thermal insulator. Because it doesn’t conduct heat and cold, it helps maintain temperature in a room.